Bruegger’s Bagels Executive Chef Philip Smith strolled into Raleigh last week to kick off Bruegger’s 30th anniversary media tour. 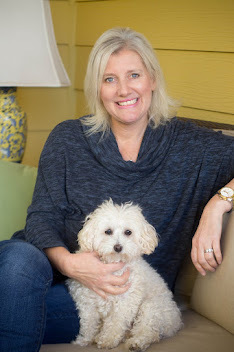 The Surry, England, native, who has been with Bruegger’s for over 10 years, is passionate about keeping the company’s signature bagels uncomplicated. “Our bagels are true to our artisan roots. We keep our ingredients simple, just like artisan bread makers did thousands of years ago. Nothing we do is mechanical or processed," declared Smith. 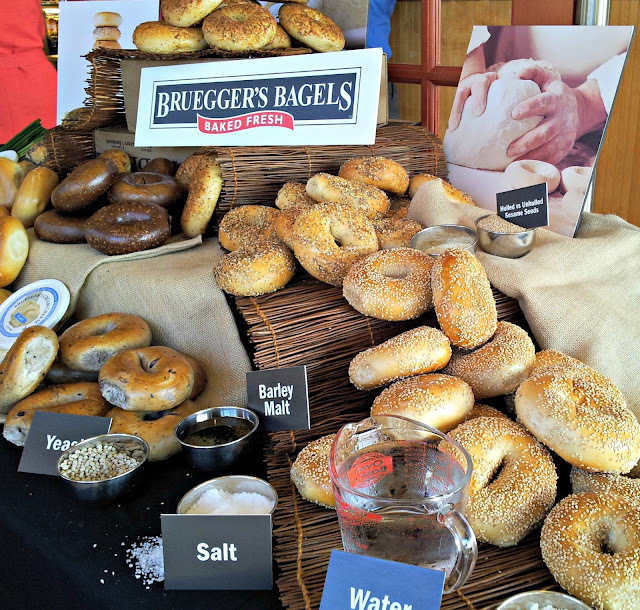 Bruegger's is celebrating 30 years of making bagels. 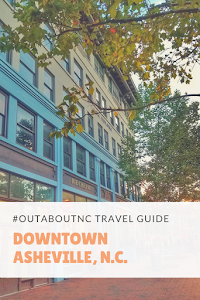 Raleigh, NC was the first stop on company's media tour. Bruegger’s Bagels is a chain with over 300 bakeries in 27 states and Washington D.C. , but the company sees itself as a local neighborhood bakery. Trained bakers start making bagels as early as 4:30 a.m. using only five simple ingredients: yeast, flour, water, barley malt, and salt. 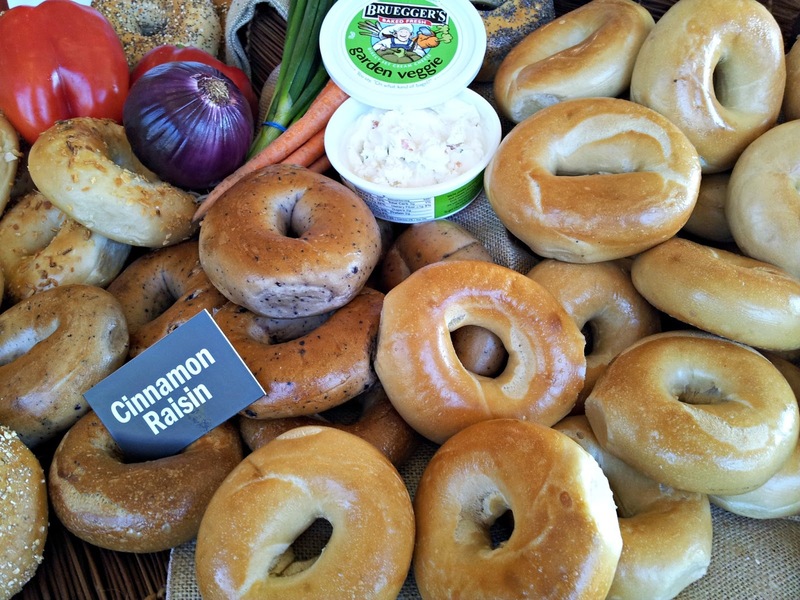 Bruegger's Bagels uses five simple ingredients when making bagels. 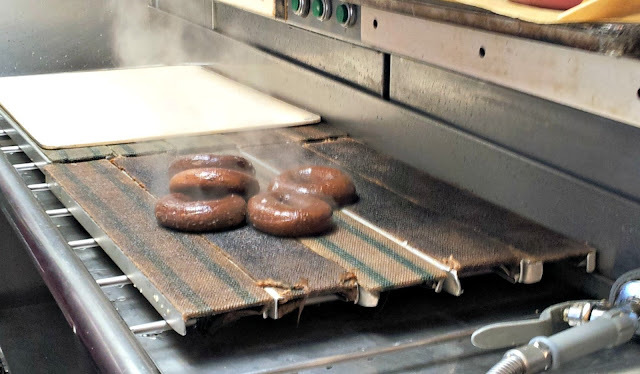 The bagels are boiled, then carefully placed in a 470-degree oven on burlap slabs to finish cooking. Like artisan bread bakers in the past, a Bruegger’s baker has to “feel the dough” to know when bagels are ready. And making bagels is a process that starts two days before the bagels are ready for the oven. Bagels are placed in the oven upside down. And trust me: Nothing is better than a hot bagel out of the oven covered with 100 percent Vermont-made Cream Cheese. 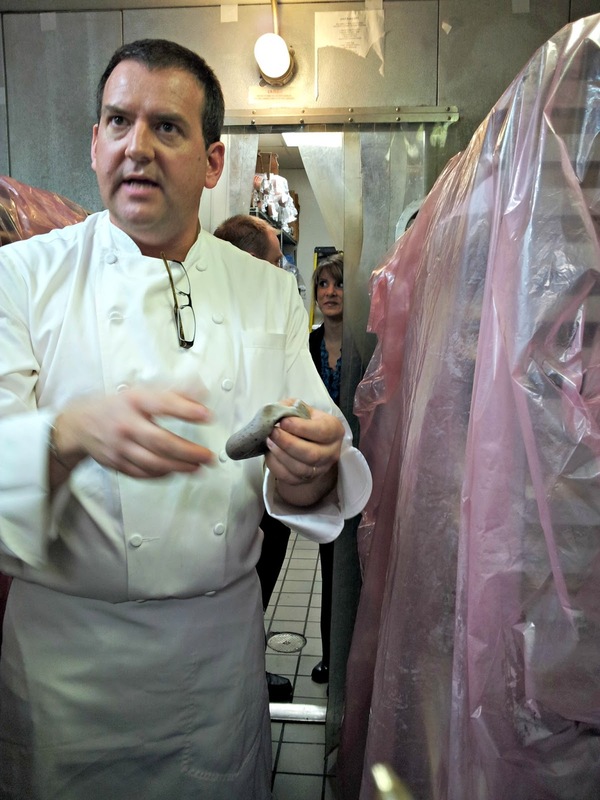 Because Bruegger’s Bagels are not processed, Chef Smith says they really aren’t good to eat after two days. That’s why you will find “yesterday’s bagels by the dozen at half-price “ in your local bakery for sale. Well, Chef Smith did a little cooking for me using leftover bagels. 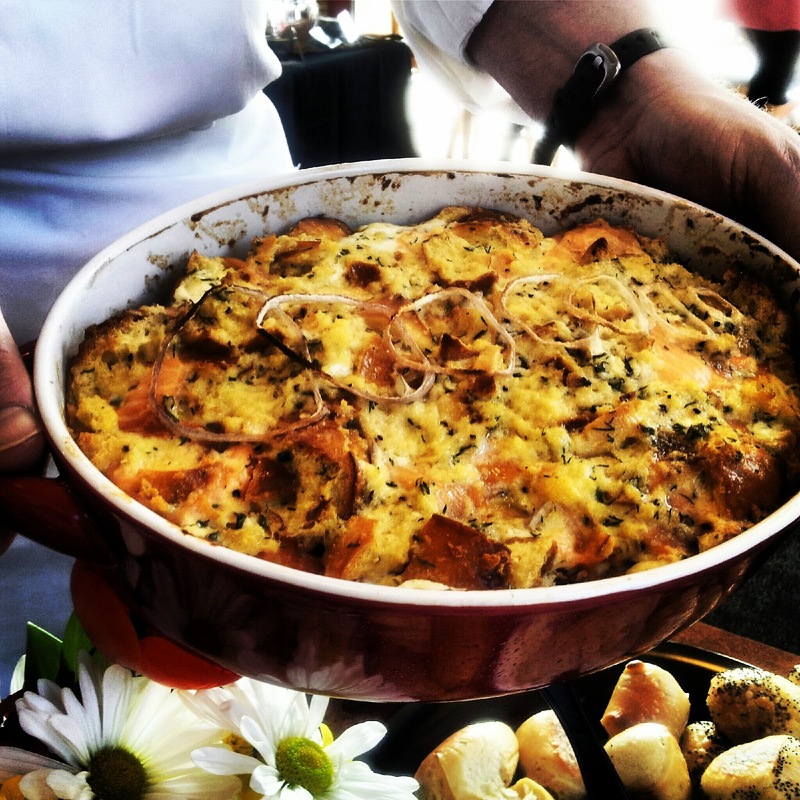 He whipped up a Smoked Salmon and Dill Strata. This strata was amazing, and he is sharing his recipe. Photo by: Chana Lynn of Raleigh What's Up? Preheat your oven to 350 degrees. Melt the butter in your microwave on high for 20 seconds. In a stainless steel bowl, beat the eggs until the yolks and whites are blended. Then add the melted butter, half and half, salt, pepper, and fresh dill. Soak the cut bagel pieces in the egg mixture, and using your fingers, work the eggs into the bread, so it is thoroughly soaked and all the custard has been absorbed. Spray a 13 inch shallow baking dish with pam spray. Layer the baking dish with 1/2 inch layer of soaked bagels. Top with a layer of smoked salmon (half lb. or half the side of salmon). Dot the smoked salmon with dollops of half the cream cheese. Repeat a soaked bagel layer and another salmon layer. Dot again with the remaining half of cream cheese. Layer the remaining soaked bagels (this layer will be thinner). Top the soaked bagels with the chopped red onion, scattered over the top. Baked covered for 20 minutes then between an additional 15-20 minutes uncovered until the egg dish souffles up and the center is firm. Chef Smith also says that Bruegger’s Bagels can be a great base for homemade stuffing. 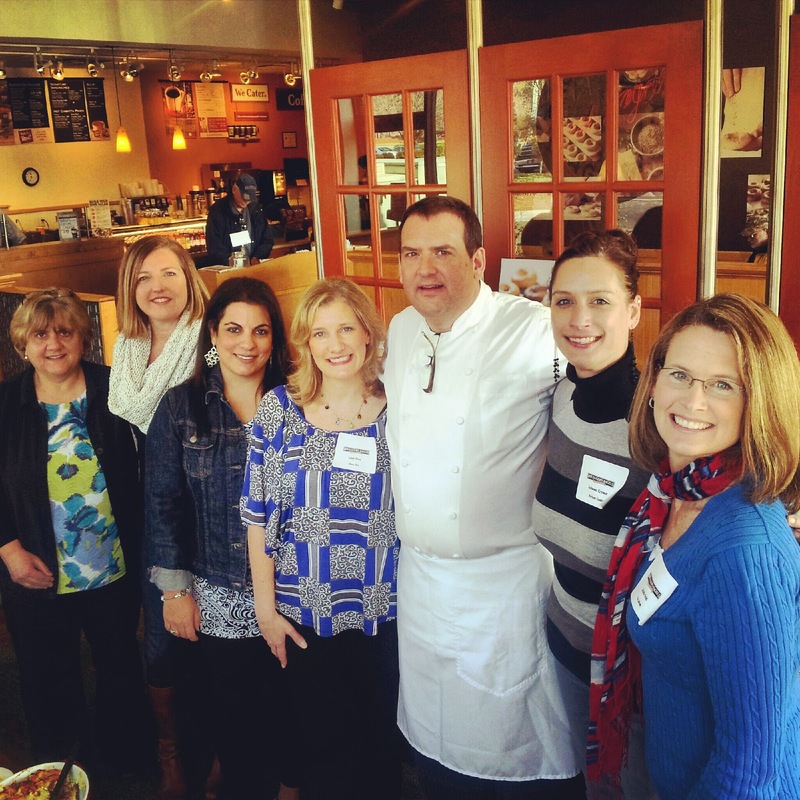 Left to right: Amy Dunn, Chana Lynn, Tina Saib, me, Chef Smith, Johanna Kramer, and Molly Gold. Bruegger’s is celebrating 30 years this year. 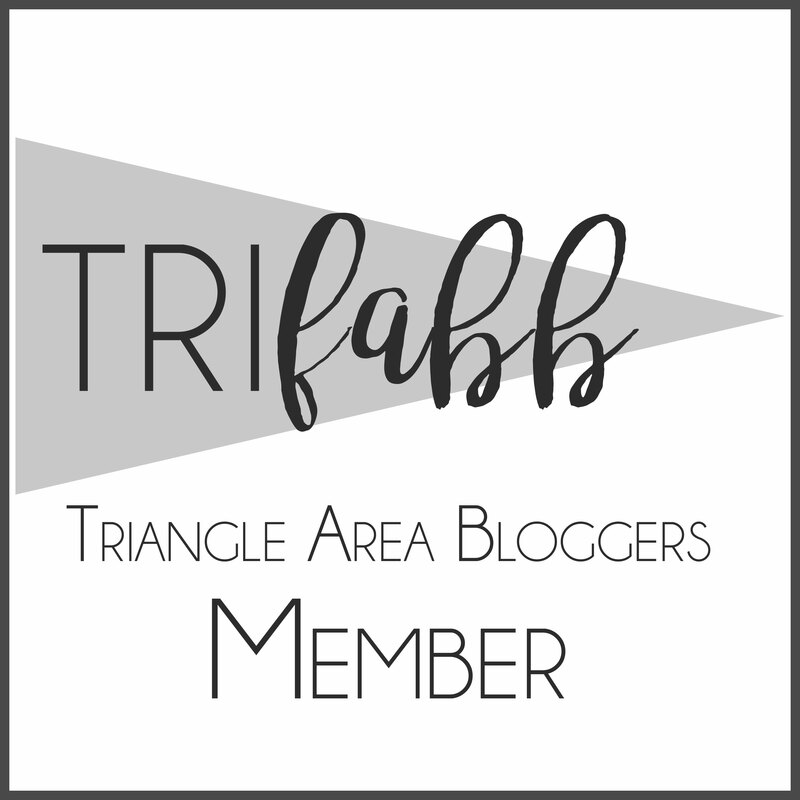 Connect with them on Facebook for anniversary specials. My favorite Bruegger’s Bagels is on Avent Ferry Road in Raleigh. You may just see me pop in there for coffee and a bagel after I drop off my son at school.